June 7 1909 -- The Angels had a doubleheader with the Seals yesterday, and performed before a record crowd. All those Angel fans were disappointed when the home team took runner-up honors in both games. This linen-era comic card was published by the Massachusetts company Colourpicture sometime in the early to mid-forties as part of their "Morale Builders Series A". It has some great-as-always artwork by the prolific Walter Wellman, who had been doing postcard work since the late oughts (often self-publishing his own work!). 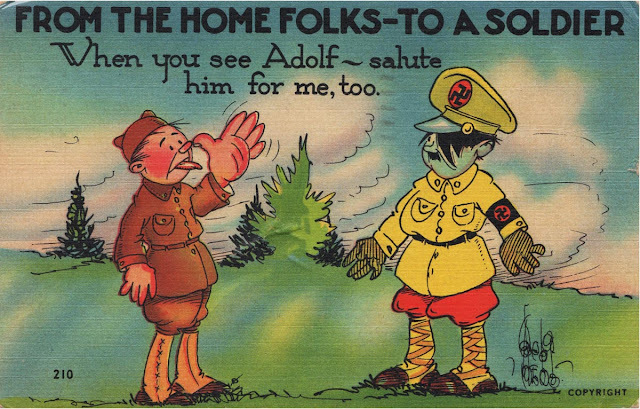 This card depicts an Army soldier razzing Adolf Hitler, which as you many know was a common subject in military comic cards around this time. There is writing on the back, but unfortunately I can't tell you what it is as I only scanned the front of this card. Interesting thing is that the artist has used more of a World War I model for the American soldier -- note the linen leggings. The tunic-top is more the World War I model, too. Suggests to me that this card might be early 1942, at a time when the U.S. Army was still using Brodie Helmets and M1903 Springfields. As well as the uniform, the tepid insult to Hitler might also indicate the card is prewar, when we were building up the armed forces for our possible actual involvement in the war. “I would rather own his God-driven pen than Rockefeller’s and Morgan’s combined fortunes.”—Thomas W. Lawson. “As a figure, a personality, a force, he has no living rival.”— Cosmo Hamilton in London Academy. “He will be the pathfinder for an army of conquerors.”—Australasian Nation. “If there is a man in this whole world who knows the value of efficiency and twentieth-century methods, as applied to business, it is this man.”—George W. Perkins. “He is a torpedo, shot from the torpedo tube of the twentieth century, aimed at the obstacles that stand in the way of the twenty- first century.”—Houston Chronicle. Ten million people will read the presentation on the two succeeding pages. Among them will be many readers of your paper. The advertisement herewith shown in facsimile costs for one issue ten thousand dollars. It represents the largest expenditure ever made in America for a single announcement of a newspaper feature. In the same degree, it expresses our faith in the value and importance of that feature. We believe that this advertisement without a parallel describes a feature without a parallel. Herbert Kaufman's Weekly Page, the premiere of which would mark the debut of King Features Syndicate. 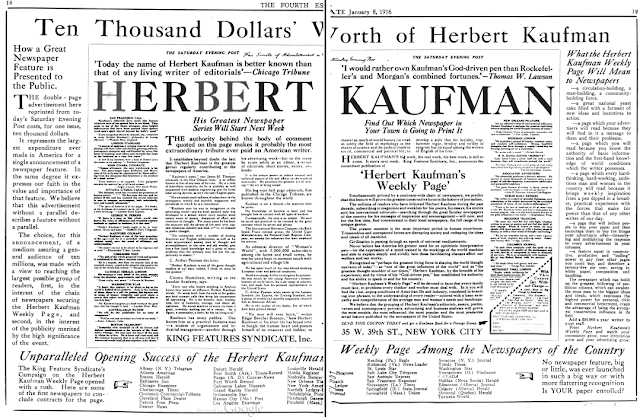 Herbert Kaufman’s Weekly Page, sparingly illustrated, included a leading article, a humorous skit in colloquial rhyme, entitled The Low-Brow on Olympus, a Kaufman editorial, a treatise on the art of advertisement, several V (Vim, Vigor and Victory) Verses and some short commentaries. 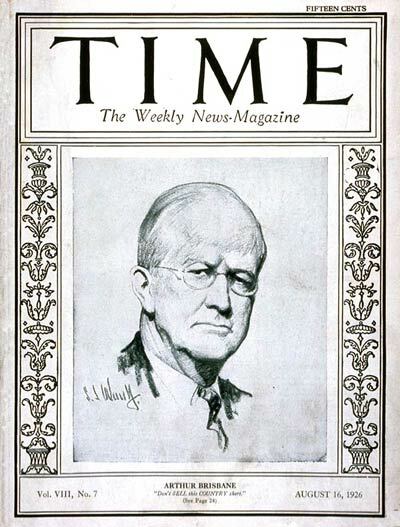 A proof of the first release was submitted in advance to W. R. Hearst with a table of rates for his Sunday newspapers. The offer was definitely declined. A week later, the broadside in the Saturday Evening Post apparently injected a good deal of excitement into the Hearst retinue. About to board a train in the Union Station at Washington, I was halted by the shouting of my name over the loud-speaker ordinarily used for the announcement of trains. It was a long distance telephone call. The novelty of the experience startled me. A squad of red-caps escorted me to a booth in the concourse. W. R. Hearst was at the other end of the wire. He hoped he wasn’t too late to secure the Kaufman page for his whole chain. Such a humility on Hearst’s part in editorial matters was incomprehensible to me at the time. Its explanation came in an amusing incident some years later. 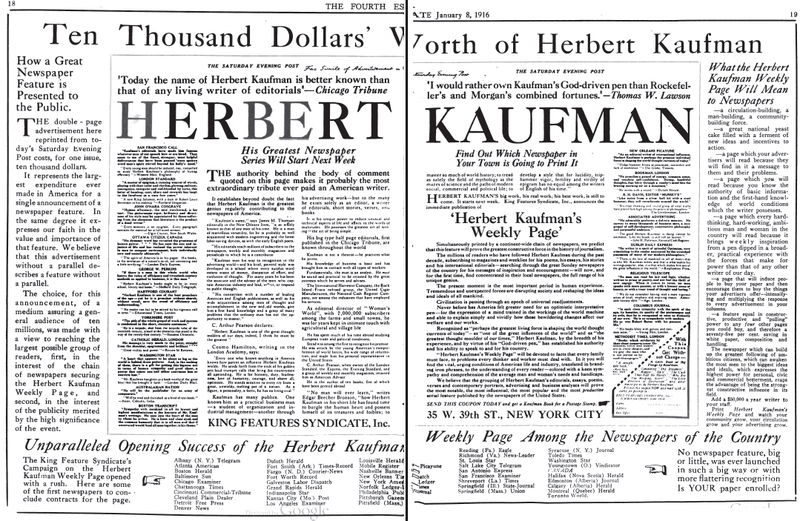 Hearst’s rejection of the Kaufman offering had been prompted largely by a solicitude on Arthur Brisbane’s account. 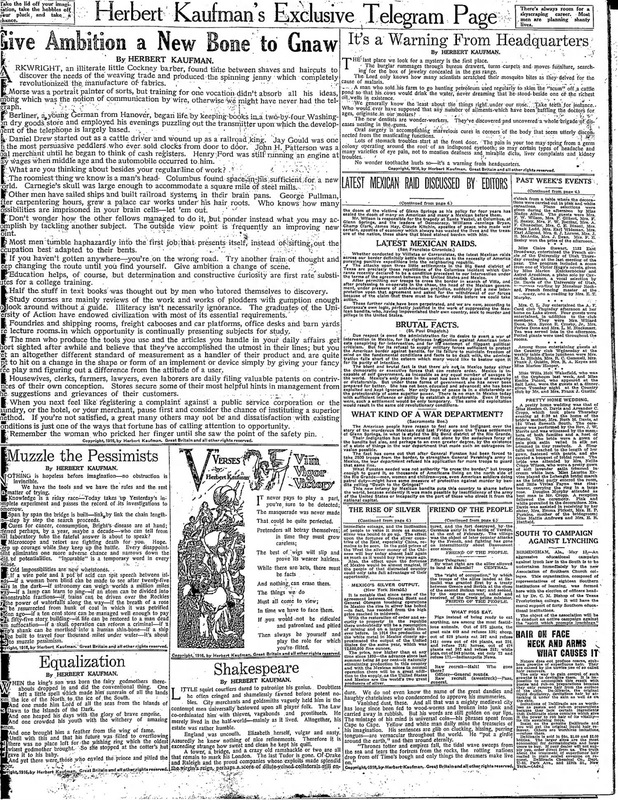 Brisbane was regularly contributing to the Sunday edition an essay, which, in large type, with a powerful supporting cartoon, occupied an entire page. It was unsigned. The mere thought of allotting equal space in the same issue to a rival commentator might ruffle the pride of Hearst’s chief-of-staff. And if that might prove irksome, what would happen if the outsider’s name were spread across the top of the sheet while Brisbane’s chef-d'oeuvre remained anonymous? Surely this must not come about at Hearst’s instance. The situation was altogether different when employees petitioned the proprietor to buy an article for use in newspapers for which they were respectively responsible. It would be ill-advised to deny such a request when concurred in by several managing editors. And it would be impolitic in these circumstances for a ranking executive to question his employer’s acquiescence. So, though Brisbane made no concealment of his dissatisfaction, it could hardly be vented in any reproach to Hearst. The niceties and nuances of this state of affairs became clearer to me when, some time after Herbert Kaufman s Weekly Page had run its course, Hearst summoned me to a private meeting. “Brisbane’s contract is about to expire,” Hearst said tersely. “He’s acting up. He may become unreasonable. Whom can we get—somebody that Artie will consider a possible successor?” Hearst’s purpose was obvious. He had no intention of breaking with Brisbane. But he wanted “Artie” to feel that a substitute was on hand to replace him. Herbert Kaufman was chosen for that role. 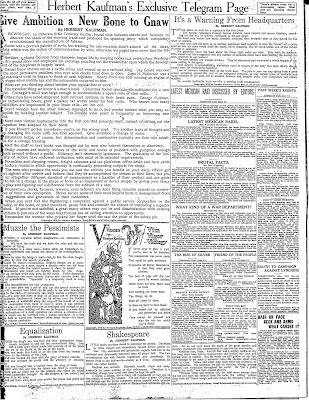 He wrote a daily review of national and international events which, by Hearst’s orders, was printed in a conspicuous position on the editorial page over which Brisbane presided. How much leverage this exerted in Hearst’s negotiation of a fresh agreement with Brisbane will never be known. Kaufman’s daily mélange went into eclipse on the same axis on which his weekly feature had swung out of syndication in 1919. This apostle of efficiency declined to practice his preachments. At least, he fell short of the exhortation to “Do it now.” His compact with King Features Syndicate stipulated the completion of manuscript six weeks ahead of the publication date. That provision was never fulfilled. Kaufman’s first batch of material was three weeks behind schedule. His copy continued to lag until the matrices of his page lost all relationship to regular shipments. The culmination came when he dictated his text over the telephone from San Francisco to New York three full days after the stereotyping deadline. Alexander Black, the author, then Sunday editor of Newspaper Feature Service, was called on to meet the crisis. In his young manhood, Black had been noted for speed as a court stenographer. He, himself, took Kaufman’s dictation over the wire. At the finish, Black asked whether Kaufman realized the difficulties he had imposed on the syndicate’s labor personnel. “Mechanics have no place in the economy of my life,” was the characteristic reply. The “circus stunt” with which King Features Syndicate crashed the main entrance of newspaperdom, furnished a new index of syndication statistics. 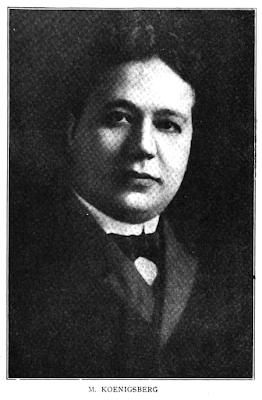 Fewer than three hundred cities in the United States boasted Sunday editions of the rank for which a minimum rate was fixed for Herbert Kaufman’s Weekly Page. The 1,500 names on the “teaser” mailing list, two to each publication, thus represented more than five times the number of prospective clients. Territorial conflicts reduced still lower the aggregate of potential purchasers. Nevertheless, on its initial release date, the feature appeared in 120 papers. The roll grew to 165. Kaufman’s 60 percent of the gross revenues approximated $40,000 annually. That was a sizable amount at the time. A decade later, it would have been nothing to brag about. The stamina that was taxed by commerce with genius of the Herbert Kaufman stripe was replenished through association with talents of the J. D. Gortatowsky type. Gortatowsky left the managing editorship of the Atlanta Constitution in 1916 to join Newspaper Feature Service. He accepted my offer of a position with little idea of what his duties would be and with far less of a notion that they would eventually lead him to the top of the Hearst organization. During twelve years he proved a pillar of strength and a reservoir of comfort as my assistant. After another twelve years, in belated appreciation of his rare capabilities, he was appointed general manager of the Hearst newspapers. That appointment was especially gratifying as confirmation of the judgment that prompted me early in our relationship to transfer him from special writing to a managerial post. Few stories of success match in quaintness the circumstances of Gortatowsky’s entrance into the syndicate field. He “kicked” himself into the place he coveted. A letter of complaint won for him an invitation to write communications “from the other side of the desk.” “Gorty” had long hankered for a reserved seat in Manhattan. It is possible that this hankering directed the poising and phrasing of his prize epistle. 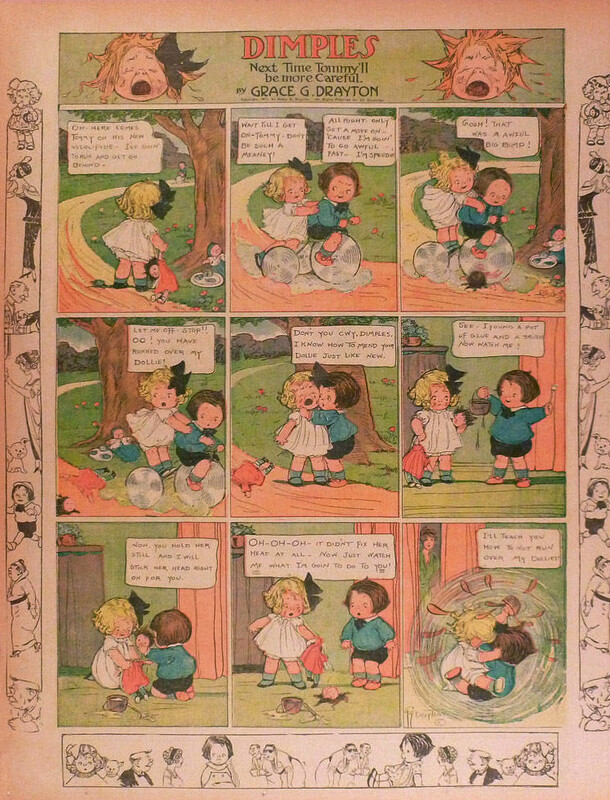 The occasion was what Gortatowsky considered an objectionable colored comic starring Dimples, the chubby five-year-old also known as “The Campbell’s Soup Kid.” It was an installment of the series created by Grace G. (Wiederseim) Drayton, whom Newspaper Feature Service held forth as one of its mainstays. The page that drew “Gorty’s” disapproval consisted of nine panels. In the eighth Dimples was shown romping with a girl pickaninny of like age. In the ninth, the two little playmates appeared in what was clearly the white folks’ nursery. They were preparing for a joint surrender to the sandman. And, horror of horrors! They were climbing into the same bed. Georgia has been called on to withstand many outrages, but, thank Heavens, it was spared the ordeal of looking upon this picture in bold print. The Atlanta Constitution went to its readers that Sunday devoid of its “funnies.” Every copy of the supplement was destroyed at Gortatowsky’s order. A possible disaster was averted, but the Atlanta Constitution had suffered actual loss and damage. All the harrowing details awaited me in a formidable dossier on my return from a six weeks business trip. It included an exchange of correspondence between Gortatowsky and C. V. Tevis, office manager of Newspaper Feature Service. There was more amusement than chagrin for me in its reading. “Gorty” did not criticize Newspaper Feature Service. Instead, he commiserated with its management. He knew it must be distressing for us to realize the injury that had been done. He blamed himself rather than the syndicate. He was at fault for the absence of adequate precautions against such an adversity. Of course, that would be corrected, but he would welcome any offers of cooperation. The letter Gortatowsky addressed to me was practically unanswerable. It described a grievance without stating it. It left no ground on which to question or debate the responsibilities. It put the syndicate on the defensive in the same terms in which it withdrew the cause for defense. The man who could frame that sort of message belonged on my staff. That was the highly desirable consummation for which Newspaper Feature Service became indebted to the broadmindedness of Dimples’ social attitude. In the 1870 U.S. Federal Census, Rehse was the youngest of six children born to J.F., a foreman, and Mary, both German emigrants. They resided in Hastings. The 1875 Minnesota State Census recorded the Rehse family in Minneapolis, Minnesota. Their address in the 1880 census was 907 7th Avenue South in Minneapolis. The family named was misspelled “Reahse”. Rehse’s father, “Fred J.”, was a retail grocer. George W. Rehse has made an enviable reputation in the Northwest by clever and good-natured cartoons, most of which have appeared in the St. Paul Pioneer Press. He is a native of the “gopher” state, and thirty-four years of age. He began his career in 1895, after several years of futile effort to “catch on.” Although he never had any art training, he has won recognition as an artist by close observation and constant application to his work. According to the Minnesota, Marriages Index, at Ancestry.com, Rehse married Nellie E. Palmer on February 4, 1897 in Minneapolis. A 1897 St. Paul, Minnesota city directory listed Rehse as a Pioneer Press artist who boarded at 589 St. Peter. The 1898 St. Paul city directory said Rehse moved to St. Louis. 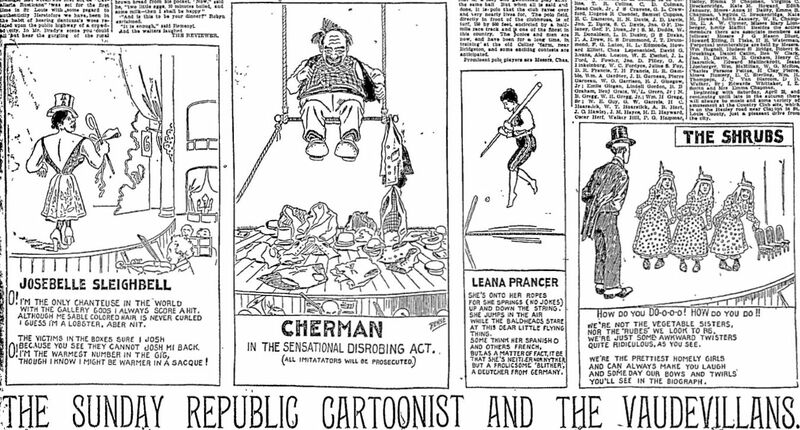 Who’s Who said Rehse was a cartoonist for St. Louis Republic. Rehse was listed in the 1899 St. Paul directory at 539 Holly Avenue and back at the Pioneer Press. In the 1900 census, cartoonist Rehse and his wife were St. Paul residents at 39 East Central Avenue. St. Paul Globe, August 29, 1900, reported Rehse’s lawsuit. George W. Rehse, artist, has begun suit in Justice Baker’s court against Osman Temple, Nobles of the Mystic Shrine, for $50, which he alleges is the value of a cartoon he drew by the order of the chief potentate. The cartoon meant fourteen hours straight work. It included about fifty figures and a number of goats and foxes. The Cazenovia Republican, (New York), November 22, 1900, published the widely distributed article about Rehse. To say that the work of George W. Rehse, cartoonist of the St. Paul Pioneer Press, is wittier than that of any of his fellow laborers in the field of caricature would perhaps be invidious, but there is no doubt that he is fully as funny as any. Mr. Rehse possesses the faculty of making almost anything look funny. When this cartoonist draws a dog, one can almost see its tail wag. His political cartoons are genuinely and legitimately funny without appealing to partisan sentiment. 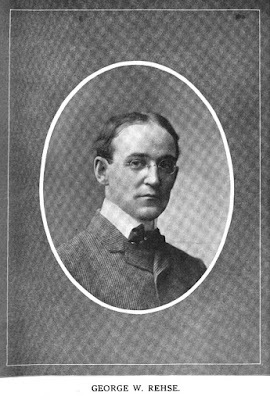 Rehse was involved with the Pioneer Press Cartoon Book series from 1904 to 1907. The St. Paul Globe, May 15, 1904, noted Rehse’s now location, “Mr. and Mrs. George W. Rehse, St. Paul, are occupying their new home on the peninsula.” The 1905 St. Paul city directory said Rehse resided at White Bear Lake. Year-book of the St. Paul Institute of Arts and Sciences (1908) listed Rehse as a cartooning instructor. The Cleveland Directory for the Year Ending August, 1909 had this listing: “Rehse George W cartonist [sic] Newspaper Enterprise Assn r 4509 Carnegie av, S.E.” Rehse’s presence in Cleveland explains his small role in A.D. Condo’s Mr. Skygack from Mars, which began October 2, 1907. 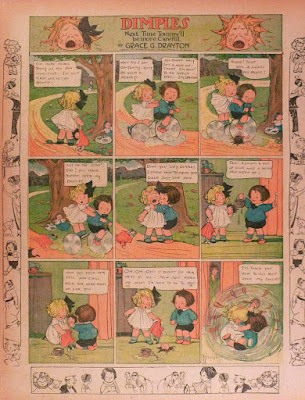 American Newspaper Comics (2012) said Rehse drew it from June 13 to 18, 1908 for the NEA. Other cartoonists in the directory were Armundo D. Condo, James H. Donahey, Johnny B Gruelle and Robert W. Satterfield. The 1909 St. Paul city directory said Rehse resided at White Bear Lake. Grant, Minnesota was Rehse’s home in the 1910 census. It appears the cartoonist and his wife lived on a street called Wildwood (the legibility is difficult). Rehse’s American Boyhood & Remember These was published in 1910. At some point, Rehse moved to New York City. American Newspaper Comics said Rehse produced In the Tall Timber, from February 6 to March 1, 1911, for the New York World’s Press Publishing. Aulsbrook picked up the series. Rehse continued Rollin Kirby’s Everyday Movies (also known as Metropolitan Movies) which began May 19, 1913. Rehse’s tenure started in January 1914 and lasted in the early 1920s. New York Tribune, July 14, 1913, noted Rehse”s overseas return, “George W. Rehse, widely known as a cartoonist, has just arrived from Paris, where he has been studying for the last year.” A passenger list said Rehse sailed from Liverpool, England to Boston where he arrived on July 10. The 1917 New York City directory had Rehse, a cartoonist at The World, residing at 523 West 157th Street. Rehse’s art was featured on the cover of School and Home Education, October 1919. Rehse’s address was unchanged in the 1920 census. Rehse obtained a passport on September 29, 1920. He was going to the British Isles for “study and observation” and France for the “study of art”. His travel was partially explained in the Editor and Publisher, October 9, 1920. Gene Carr, for the past eighteen years with the comic section of the New York Sunday World, has been transferred to the metropolitan section of the Sunday World, succeeding George W. Rehse, who resigned last week. Rehse returned to New York on June 2, 1921. American Newspaper Comics said Rehse drew Children of Adam for the Ledger Syndicate. The panel ran from February 20 to November 5, 1922. Rehse’s fourth trip over the Atlantic Ocean began with his passport application on October 21, 1922. Rehse planned to be away for two years to study in Portugal, Spain, Gibraltar, France and Austria. He returned September 5, 1924. According to the 1930 census, Glendale, Los Angeles County, California was Rehse’s home. The self-employed cartoonist and his wife lived at 1900 Chilton Drive. The same address was found in Glendale directories from 1930 to 1936. Rehse passed away December 2, 1939, in Burbank, California. The Editor & Publisher, December 9, 1939, reported Rehse’s death. George W. Rehse, 70, retired newspaper cartoonist, was found shot to death in his automobile Dec. 2 at Burbank, Cal. A gun and note telling of ill health and grief over the death of his wife were besides the body. After working in Minneapolis, he became political cartoonist for the old New York Evening Mail. He later joined the Morning World. Rehse was laid to rest at Grand View Memorial Park and Crematory. Back in the oughts and teens, there must have been a constant battle to keep the back pages of the New York Evening World filled with cartoons and strips. Many's the time that items of questionable merit found their way onto the pages of even such an august daily, and of those some even stuck around for a good while. For instance, on February 6 1911 a new weekday panel cartoon debuted, titled In the Tall Timbers. A relatively bald-faced copy of Abe Martin, the only nod to originality was that a small cast of recurring characters delivered the rusticated wisdom instead of just one emcee. It took two creative talents to produce this copycat: George W. Rehse handled the art, while someone named Aulsbrook provided the pickle barrel wisdom. Rehse seemed to get cold feet about having his name on this dog, and last signed it on March 1, while Aulsbrook, often using the not-particularly-jaunty contraction 'Auls', took credit until the end on September 7. At the time of my book's publication, I believed that Aulsbrook took over for Rehse; however, now being able to peruse at the Evening World at my leisure in digital form, I have concluded that Rehse continued on, but decided to stop signing his name. 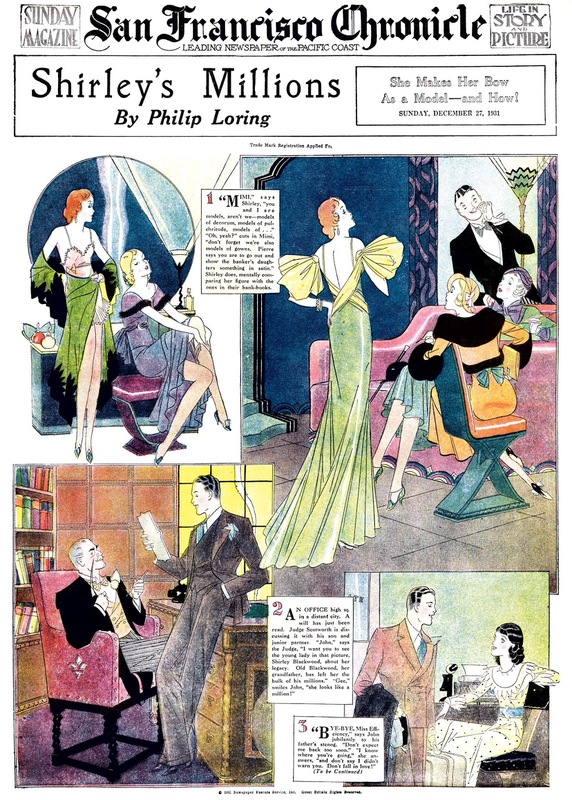 Why Paul Robinson used a nom de plume for his magazine cover comics I don't know, but his last outing under the guise of Philip Loring was Shirley's Millions, which was offered by Newspaper Features Syndicate to run from December 27 1931 to March 6 1932. If you've seen other magazine cover comics, I'll bet you can read the first page of this series and pretty reliably fill in the rest of the story. Sure are some purty pitchers, tho!